Flowdock, a group chat application for teams and businesses, has raises $650,000 in seed funding from Gil Penchina, CrunchFund, Marten Mickos, and IDG Ventures. 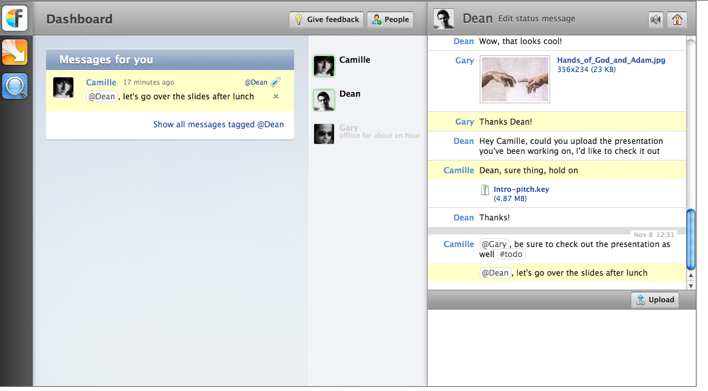 Flowdock, which aims to disrupt the group chat space, is a collaboration web app for technical teams. As we wrote in our initial review of Flowdock, the startup brings activity from your project management tools (Pivotal Tracker, JIRA), version control systems (GitHub, BitBucket, Kiln), customer feedback channels (Zendesk, email lists) and many other sources to a single stream. Team can then work on the issues together, chat about problems, and react in seconds. The virtue of using the products is that it allows development teams to track, archive and act on real-time chat, a key functionality which is missing from many collaboration or chat applications. For example, a customer service team using Zendesk cannot resolve a development issue by themselves. They can escalate it to the development team’s Flowdock and the development team can then discuss and resolve the issue in minutes. Normally, this sort of correspondence is done over email or even Skype, and takes longer to resolve. The product, which is available via the web and a desktop app, includes real-time group chat, the ability to upload files, notifications, and more. There’s a free 30-day trial for Flowdock, and paid plans range from $19 per month to $159 per month. The startup has already seen a pickup in customers, and counts Pivotal Labs, TED conferences, and Appcelerator as users. Flowdock faces competition from Hipchat and others.